Cheer on your favorite team with your own custom dog, get started with our ideas and build your own from there. Place bacon-wrapped hot dogs on a sheet pan and set under the grill/ broiler,and cook until bacon is crisp and fully cooked and hot dogs are heated through, about 6 minutes, rotating the hot dogs several times to evenly cook the bacon. 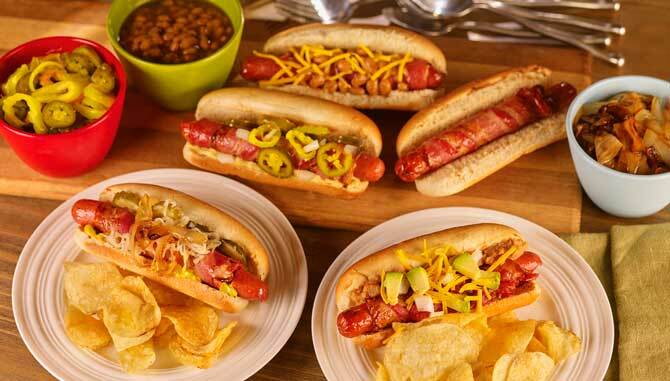 Place a bacon wrapped dog in each bun and set on a serving platter for guests to load up with toppings. Meanwhile lay out toppings, fry onions and heat beans. For the Seattle Seahawks dog: load bun with cream cheese and top dog with relish, fried onions and hot peppers. For the Arizona Cardinal dog: top Hoffy bacon wrapped dog with refried beans, cheddar, salsa, avocado and chopped onion. For the Dallas Cowboy dog: top hot dog with baked beans, cheddar, ketchup, and fried onions. For the Pittsburg Steelers dog: top bacon wrapped dog with sauerkraut, fried onions, pickle chips, and lots of mustard.